Hiya guys! I'm back and we are kicking off the week with my first polish swatches of the new year. Honestly I was supposed to post about these last week, but it has been a little mentally draining to sit down and focus. Long story short I had surgery last month and found out last week that it did not solve my pain. So I basically went through surgery, a month of pain, for nothing. Yeah not quite how I wanted to kick off the new year. It's hard but I don't want this to stop the ambitions and goals I have for myself in 2019. So what better way to take my mind off things than just getting back to what I love. Nail Polish! For today I'm sharing swatches for the Jelly Brites Collection by Zoya, which was released mid last year. This is actually one of many MANY posts of past releases/collections that I was never able to get to due to my health. I'm excited to finally be able to swatch all these beautiful collections most of which are still available. So without further ado, let's go ahead and get started! 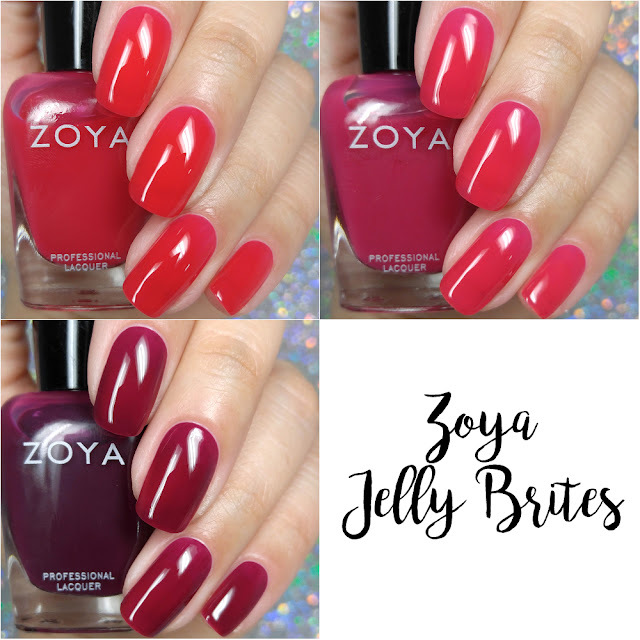 The Jelly Brites 2018 Collection by Zoya is available for purchase online. Each full-size bottle retails for $10 or you can grab the entire collection for $30. Molly can be described as a translucent red/pink jelly. We are kicking off this review with my favorite among the three and really it shouldn't be a surprise. I'm ALWAYS a sucker for a luscious red plus throw in that squishy finish. Damn. I think I am head over heels. It's like the perfect shade to wear this time of year too with the holidays having past and Valentine's around the corner. Maybe it's the sassy minx in me, but I always think red is a year-round safe color to be honest. Everything about this shade screams must-have for me. Is it a unique polish? 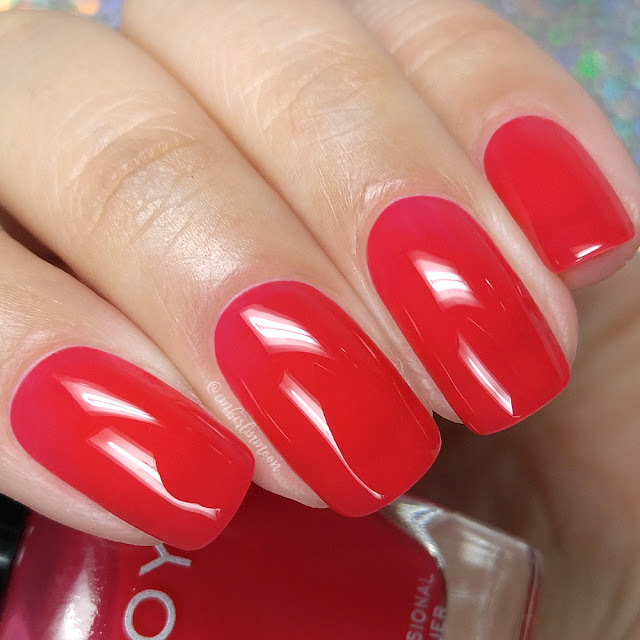 No, we've all seen a red-ish jelly polish before and I probably have some in my collection. But to my what makes this beauty is stand-out among the rest (and what makes me shout must-have) is the formula. It always comes down to that application! The formula has a sheer application as intended for a jelly finish. It builds-up extremely well and builds-up for full coverage easily. Consistency wise it's well balanced, not too thick or too thin. I had no issues during the application and found it super easy to work with. It dries down to a high-shine squishy finish on its own, but I did add a topcoat as well. I experienced some minor staining to my nail beds and cuticles, but was easily removable and not long lasting. Shown in three coats and sealed with a glossy topcoat. Paris can be described as a translucent fuchsia jelly. Normally I'm not one to be drawn into a pink tone, but it's really hard for me to resist a jelly finish. I know so many would probably find that weird, since it's such a simple finish but it does things for/to me okay! Haha. I mean can't you just picture this paired with some floral nail art?! 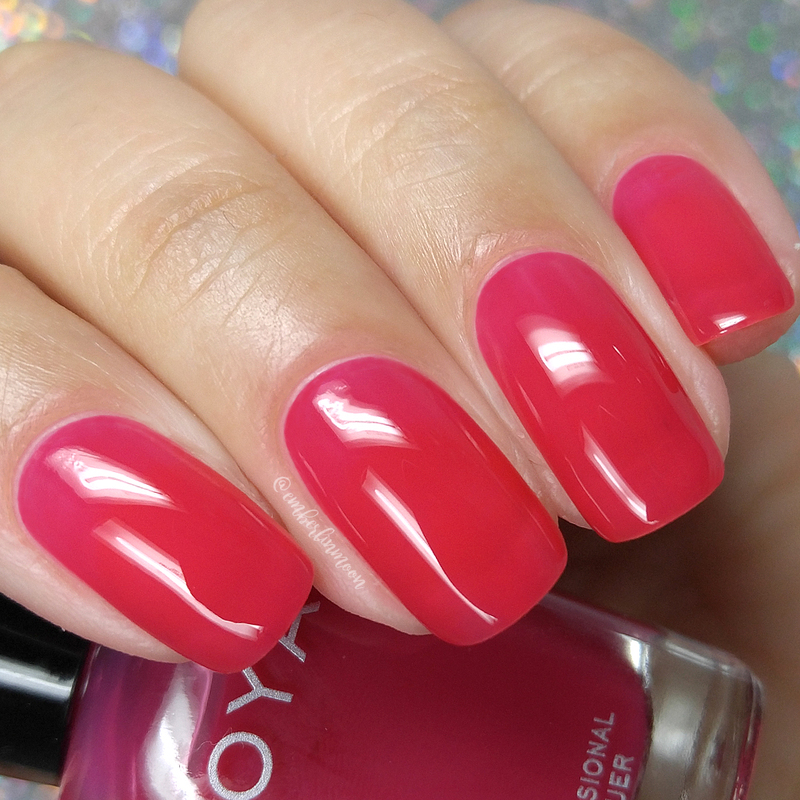 I love how bright and fun this shade looks, definitely another one that's easier to wear year round. It pulled a bit of warmth from my skin-tone but it wasn't too overwhelming to cause it to clash. Now the color doesn't like knock me out the way Molly did and honestly pales a little in a side by side comparison for me. That said, if you're a fan of pink and are looking for something fun to wear this is it. This whole collection is like that breath of fresh air among the sea of holos and shimmers. The formula has a sheer application as intended for a jelly finish. 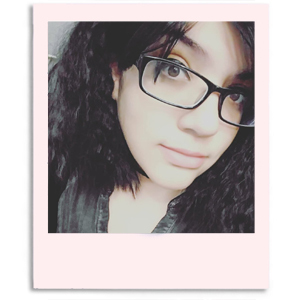 It's very similar to Molly with the exception of the opacity. This shade felt like it showed my nail line despite the same amount of coats, but it's not as evident in photos as it is in person. Consistency wise it's right on par and not too thick or too thin. It was pretty easy to work with and to layer for almost full coverage as I mentioned. It dries down to a smooth high-shine squishy finish on its own before topcoat. I did experience some minor staining to my cuticles on removal, but none to my actual nail bed. Shown in three coats and sealed with a glossy topcoat. Alia can be described as a translucent plum jelly. Closing out this review and unfortunately it's my least favorite among the trio. I really didn't think it was going to be the case since I'm usually drawn to plum/purple shades. In the bottle the shade looks a bit more dark plum, however, on the nail the color mixes with a bit more punchy pink. I think perhaps if the color ended up being that darker shade like it appears in the bottle I would probably love it a lot more. The tone brings out a bit of warmth from my skin-complexion but not too much to cause any clashing. The formula has a sheer application as intended for a jelly finish. Unlike the other two shades in this trio I didn't find this one to build-up as well. It didn't self-level like the others and appeared streaky/patchy even after layering. The opacity was also the sheerest from the collection, which didn't help with the streaking issue. Consistency wise it's well balanced, not too thick or too thin. Among the three shades, this is the only polish from the trio that did not cause any staining on removal to either my cuticles or nail beds. Shown in three coats and sealed with a glossy topcoat. To recap, the Jelly Brites 2018 Collection by Zoya is available for purchase online. Each full-size bottle retails for $10 or you can grab the entire collection for $30.